Medieval Barbarian Swords for sale are 43 ¼ inches in all. 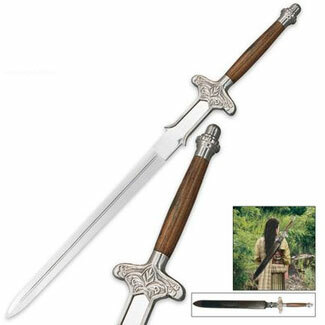 The Barbarian Sword features a 30 ½ inch blade made of solid stainless steel. The factory edged blade is 1/8th of an inch wide. The long handle is crafted of smooth polished hardwood and capped by a polished steel pommel. The polished steel guard is engraved with intricate medieval designs. These swords include a leather scabbard. Buy the popular Medieval Barbarian swords for $59.99.